I often make quail in different forms with unique combinations of seasoning ingredients. This one is extremely spicy and tastes great. Serve this delicious quail preparation with simple fried rice and flatbread. The black pepper sauce used in this recipe can be used for chicken too. To get the best results and the desired flavor, do not change the proportions of the sauce ingredients. If prepared in excess, you can keep this recipe in refrigerated form for up to 2 days. Just before serving, squeeze a generous amount of lime juice on top. You can also make the oil-free baked version of this mouthwatering recipe. Let's get started and quickly make this fulfilling and flavorful quail recipe in a few simple steps. 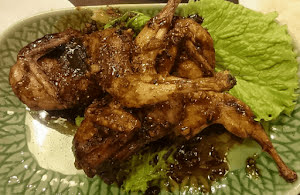 Savor this spicy, juicy, and scrumptious quail recipe which is cooked with a unique and hot black pepper sauce to give it a fiery, aromatic, and a zingy flavor. Heat peanut oil in a large nonstick pan on a medium flame. Add ginger & garlic paste to the pan and stir fry for a minute. Now add white onion paste and again stir fry for a minute. Follow with addition of ground black peppercorns, dark soy sauce, oyster sauce, rice wine, and sugar. Gently stir for half a minute and add half a cup of water. Simmer till the sauce thickens. Add quail pieces and coat them with the sauce while stirring gently. Cover the pan with a lid and switch the flame to low-medium. Cook for about 12 minutes. Drizzle lime juice on top and serve hot.